The wall on the left has been badly cracked by roots undermining the foundations. On the right the tree has moved, lifted and bent the wall of this house over and out of shape. Cracks and damage to walls and foundations are caused primarily by soils that contract and expand due to moisture content when the soil absorbs water and swells up and then shrinks when it dries out. This puts pressure on foundations, and if not designed and built correctly will lead to walls cracking and even collapsing. Other soil types, dolomite for instance, can dissolve in water during heavy rains or when drainpipes and water pipes leak. This is why a professional geotechnical inspection is required in certain areas. Rain water takes up carbon dioxide in the atmosphere and in the soil (where the concentration of this gas may be up to 90 times greater than in the atmosphere) to form a weak carbonic acid. This weak acidic groundwater circulating along tension fractures, faults and joints in the dolomitic succession causes leaching of the carbonate minerals. The solubility of dolomite is high in comparison to other rocks, but significant solution cannot be seen over short periods (months or even years). The process of dissolution progresses slowly in this slightly acidic groundwater (above and at groundwater level). The resultant bicarbonate-rich water emerges at springs and is carried away. Pay attention to drainage of the site. Stormwater and garden irrigation water should not be permitted to pond within 1,5 m of masonry walls. Ensure that shrubs are not planted too close to masonry walls. 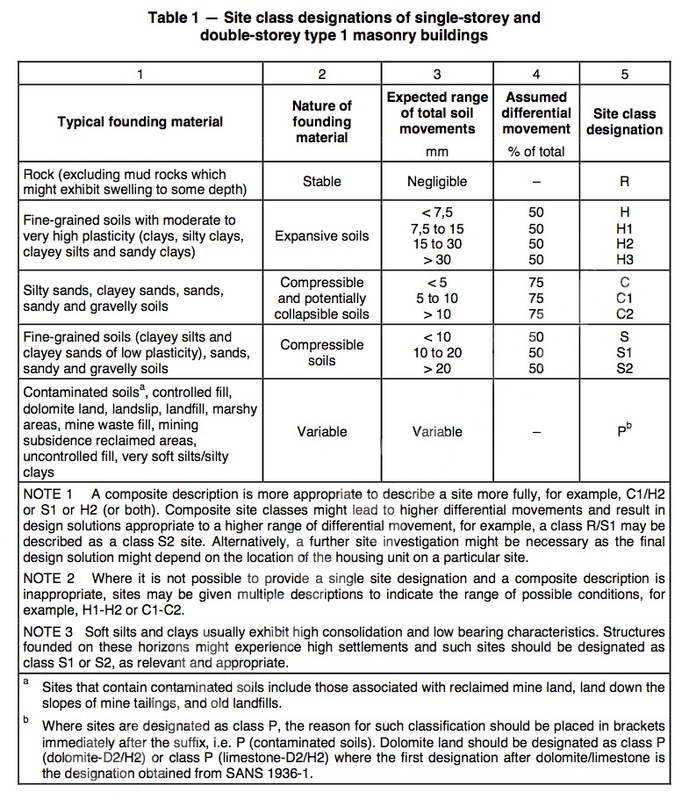 The regulations specify a minimum distance of 1,2 m on Class H sites, and 1,5 m on Class C1, H1, and S1 sites. 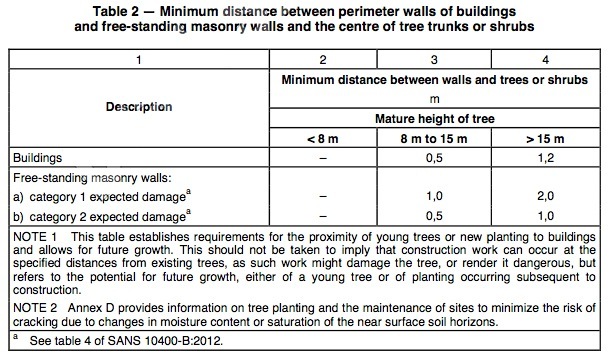 Ensure that trees are not planted closer to masonry walls than the distance stated in the table below. Ensure the prompt repair of leaks in all plumbing and drainage. Many structures are likely to be located in close proximity to planted or self-sown trees during their useful life. 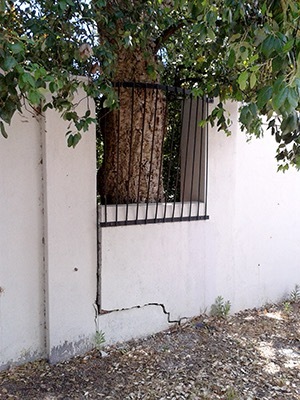 In some situations, trees can adversely affect structures and induce damage. d) by being blown over. The growth of the base of the trunk, or of roots near the surface, exerts comparatively small forces. Paving slabs or low boundary walls can be lifted or pushed aside very easily, but heavier structures or stronger structures are more likely to withstand these forces without damage. The greatest risk of direct damage occurs close to the tree from the growth of the main trunk and roots, and diminishes rapidly with distance. 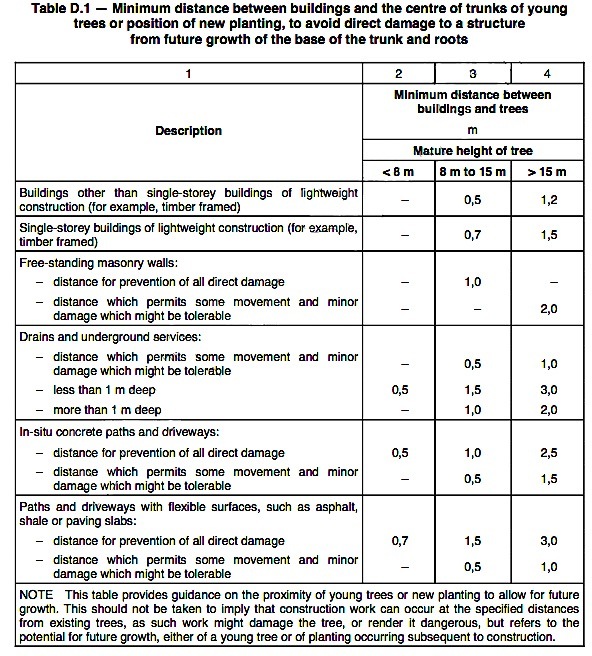 The risk of damage can be minimized should precautions be taken when the distance from trees is less than that given in Table D.1 (below). 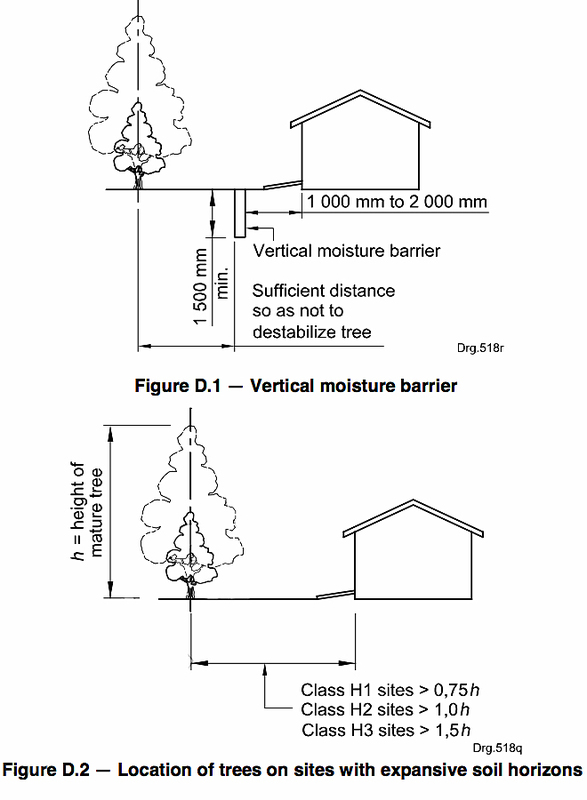 New trees should not be planted closer than indicated in Table D.1. Where these distances are not observed, precautions, such as the reinforcement of foundations to resist lateral thrusts and the bridging over of roots to allow for future growth, should be adopted. Water leaking from damaged drains, sewers or water mains will encourage localized root growth. Roots are then likely to enter a drain or sewer through the defect and proliferate, causing blockages and so aggravating the initial defect. Intact drains, provided they are further from trees than the distances stipulated in Table D.1 (above), should not suffer direct damage and will not attract roots. More than 99 percent of water absorbed by trees is transpired through its leaves into the atmosphere. This causes the soil to dry out and, in the case of clay soils, to shrink. Any subsequent wetting up of the clay will induce swelling. In this manner trees and large shrubs can induce movement on clay founding horizons resulting in damage to structures. 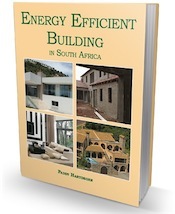 The severity of movements so induced depends on the percentage of clay content and the mineralogy of the clay, the depth and extent of the root system of a tree and the efficiency of a particular type of tree to extract moisture from the soil. The effects of the removal of trees on clay sites should also be considered. It is important to realize that removal might induce large swelling movements as soil profiles wet up, particularly where trees have depressed the water table over a period of time. This oak tree has pushed the wall and created a big crack. 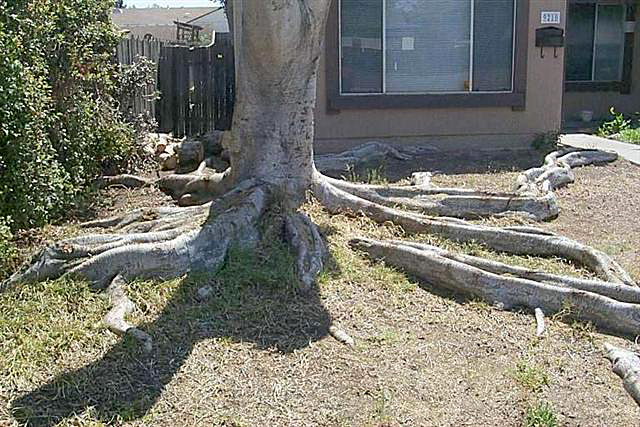 Some trees have roots that are shallow and spread very wide and can cause havoc with foundations. “Ensure the prompt repair of leaks in all plumbing and drainage.” How do you know if your sewerage plumbing system which is under ground is leaking? Also in the last devastating photo the tree looks to be more than 1.5 meters from the house which is correct according to the above table. 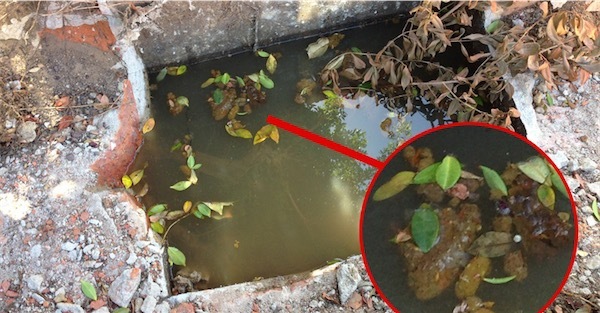 Hi Jacques, Yes that is a tough one to monitor but in my experience once the outlet pipes start to leak then roots get in and block the outflow, see the story here: http://sans10400.co.za/blocked-drains/ This had multi problems a squashed pipe and roots growing into pipes. In answer to the tree that is more than 1.5m away the regulations do say that you must choose a tree variety that does not have shallow spreading roots. Avacado tree and about 15m height is 12m away from the house.I would like to ask how much the damage its will cause in more years to come. Hi Zipho, I am not a tree expert so I can’t give you advice on this. I suggest go to your local plant nursery and ask an expert there. Caesalpinia ferrea, the beautiful leopard tree, may seem to be an African tree, but it actually originates from Brazil. You’ll find this delicate tree already showing lots of character as it stands with its pale, upright trunk in a 20-litre nursery bag. The rust-brown new leaves at the growth points of its many branches, and the mid-green,compound oval leaves further along the branches are attractive and delicate and it is plain to see that this tree is not going to provide deep shade. (This also means that you won’t need to go searching for deep shade plants that battle to grow amongst tree roots.) The smooth bark exfoliates easily but incompletely, often leaving large dark brown patches against a light background – the reason for the common name. If you are in a nursery somewhere in Johannesburg or Cape Town, they might say that this is a slender tree with an unusual trunk, and that it is ideal for small gardens. This is because in moderate climates that experience light frost or dry summer climates, the leopard tree is not a giant – Mother Nature stunts its growth. But be warned, if you plant it in Durban or the Lowveld, (its natural habitat is similar to our humid subtropics) the leopard tree grows to 15 m tall with an aggressive root system that mirrors the size of the tree above the ground. 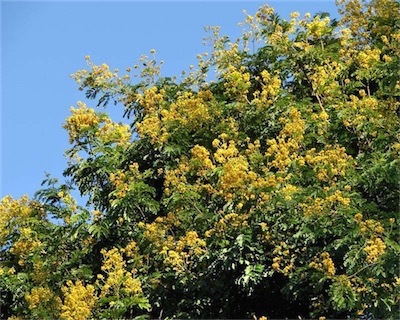 Caesalpinia ferrea should rather not be planted close to structures, underground cables, drains and water pipes. But if you have lost your heart to the exotic tree, do plant one or more in your garden, or even in large pots in your courtyard. Tiny, golden yellow, bell-shaped flowers appear in spring, followed by dark seed pods. Moderate and subtropical regions are its favourite. It is frost-sensitive and doesn’t like windy conditions. Location: full sun or light shade. A few planted together make a pretty mini-forest in an expansive lawn, or with ground covers planted between them. Water: regular watering for saplings, less water for mature trees. Medium water consumption. * Slender deciduous tree providing light summer shade. * Lovely in a mini-forest. Posted by: Administrator – Tue, Apr 23, 2013 at 2:27 PM This article has been viewed 12732 times.